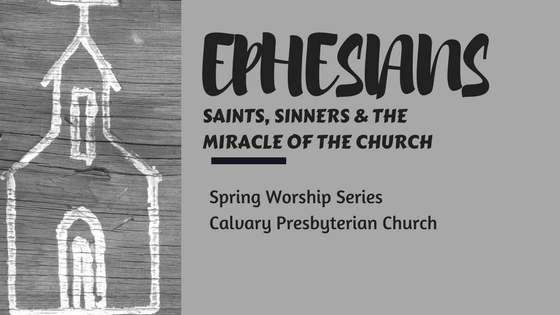 We are at a transition point in Ephesians, moving from an exuberant exploration of who God is and the way God works to a detailed account of who we are and the way we work. Paul gathers everything he has written so far into a single word that gets us ready for what comes next. The word is “calling.” God’s word to us is inherently a call, an invitation, a welcome into his presence and action. When we respond to that call, we live a calling. That calling gives us a destination, determines what we do, shapes our behavior, and forms a coherent life. Our English word, derived from the Latin for “call”, is “vocation.” Vocation or calling is a way of life. Vocation is different from a job. A job is an assigned piece of work. When the work is done, the job is over, and we go back to being ourselves, free to do anything we choose to do. A vocation, by contrast, is comprehensive. It involves our whole lives. The verb “call” is the root of the Greek word for church, ekklesia. Paul uses the word nine times in Ephesians. For the Greeks it was not a religious word. It simply meant an assembly, a gathering of people who have been called together in a designated place, such as a public meeting, celebrations, family reunions, or the like. In the Greek translation of the Hebrew Bible, the word it translates is “congregation” but always with the implicit meaning of “God’s congregation” or “the assembly of God’s people.” The useful thing the word does is keep us mindful that this assembly, this congregation, this household of God, this body of Christ, is the community of the called—we who now have a calling. God’s call and our calling fuse into church. Thus far in the letter Paul has been in preaching mode, but with chapter 4 he shifts into language that is more encouragement than exhortation. It is the language of discernment directed to the insights and decisions, the behaviors and practices, that emerge from hearing the gospel preached and learning the truths of Scripture as they then get prayed and embodied in the lives of God’s assembly. It is the type of language Jesus uses in his final conversation with his followers as it is recorded in John 13-18. The disciples have listened for three years to Jesus’ preaching and teaching. They have heard about God’s kingdom and salvation. Parables and discourses and prayers have made everything vivid. What is needed now is for it to get assimilated and digested, metabolized into the muscle and bone, the nerve endings and brain cells of the body of Christ. They have a new basic identity: friends, disciples, followers of Jesus. But, they have just begun. They need to grow up, to become what they know, to mature in Christ. This discernment language is the language of the Holy Spirit, a language of relationship and intimacy, a way of speaking and listening that gets the words of Jesus inside us so that they become us. It is not new or more information. It is not explanation. It is God’s word embodied within us, being worked out in the details and circumstances of our lives. This kind of language is only credible if it is spoken from a life lived “with all humility and gentleness, with patience, bearing with one another in love, making every effort to maintain the unity of the Spirit in the bond of peace.” Notice that not one of these five marks of the “calling to which you have been called” has anything to do with knowing the right words or understanding the correct doctrines. These are all words that speak to how we live in relationship. The only adequate or “worthy” way to articulate our calling as the church, as the company of the called, is with humility, gentleness, and patience. There is no room for arrogance, harshness or being in hurry. Becoming mature takes a long time and it is a complex process. There are no shortcuts and it cannot be hurried. The only environment in which this can take place is a community in which love and peace are actively pursued. We violate the very nature of our calling as church when we depersonalize people by not bearing with them in love or act competitively towards one another, refusing to treat others as companions bound by a covenant of peace. No matter how passionately we preach the good news of salvation or accurately and thoroughly we teach the truth of the kingdom, if we don’t master the practice of Spirit-infused relationship, the chances of growing to the “measure of the full stature of Christ” are dim. There is a lot to reckon with in this business of being called: the torrent of metaphors, the cascade of God-activated verbs, the exuberant life of prayer, the extravagant grace. It leaves our heads swimming and now Paul is pushing us to actually live here, to take up permanent residence in this kingdom of life and love—getting jobs, raising families, making ourselves at home in this life of resurrection and Spirit, growing up and growing old here and doing it together as one, one family of those who are called. The seven-fold dimension of unity is not an accident. We are meant to hear the echoes of the completeness of the seven days of creation, the seven “thunders” of the voice of the Lord in Psalm 29, the frequent use of seven in Revelation—seven churches, seven seals, seven angels with seven trumpets. The seven items do not indicate that each one is a unity unto itself but that each measures the basic unity of God and church, the Christian calling in its many dimensions. All and one. One and all. The two are inseparable. As has been extensively observed and critiqued, contemporary American society does not offer the kinds of conditions that are useful for growing up. Maturity is not the hallmark of our cultural ethos. Youth is celebrated; the elderly are not. External markers of “success” are lauded and aspired to, often with little to no emphasis on personal character. That has contributed to our culture’s conspicuous obsession with “getting and spending.” Instead of becoming more, we either get more or do more. So, it is not surprising that we are constantly offered maps for living better, maps that don’t require us to grow up: maps to financial security, sexual gratification, athletic prowess, a better job, a newer car, a better education, a more exotic vacation. As it turns out, these maps never get us to where we want to go: the more we get and do, the less we are. We regress to the condition of children, “tossed to and fro and blown about by every wind of doctrine, by people’s trickery, by their craftiness in deceitful scheming.” (4:14) In the United States alone, it is a multi-billion-dollar business annually to convince us that retail, entertainment, sports, the government and tragically, even the church, have the maps we want and need. There is one caveat. As we well know, church is not ideal. It is not, nor was it ever intended to be, a gathering of the nicer people in town. There are sinners aplenty, hypocrites in droves, the ill-mannered and unwashed and clueless. We will be mightily disappointed if we look around expecting to meet women and men who measure up to the “full stature of Christ.” Instead, we are surrounded by women and men who are on the way to growing up to the stature of Christ, but we are not there yet and that’s okay. We’re on the way and we’re helping one another get there—all for One and the Holy One for us all. Thanks be to God. Amen.